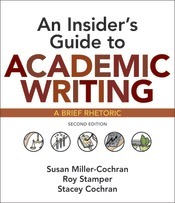 Valued for its clear, accessible presentation of disciplinary writing, the first edition of An Insider’s Guide to Academic Writing was celebrated by adopters at two-year and four-year schools alike. With this second edition, the authors build on that proven pedagogy, offering a series of flexible, transferable frameworks and unique Insider’s video interviews with scholars and peers that helps students to adapt to the academic writing tasks of different disciplinary discourse communities - and helps instructors to teach them. New to the second edition is additional foundational support on the writing process, critical reading, and reflection, to give students stronger tools to apply to their disciplinary writing.